The “cordless jobsite” took a huge step closer to becoming reality June 21 when DeWalt unveiled a new battery and charging system that covers tools from 20 volts to 120 volts. The company brought media from all over North America to Baltimore to a “secret location” in a hanger on an airfield to introduce the company’s new Flexvolt battery and charging system. The 60-volt Flexvolt battery automatically senses the power requirements of the tool and can run the company’s 20-volt tools along with new lines of 60-volt and 120-volt units. Used in a 20-volt tool, it provides up to four times the run time of a 20-volt battery. “I believe the new Flexvolt system will transform the industry,” remarked Frank Mannarino, president of Stanley Black & Decker’s professional products group. The 120-volt line – at this point only a mitre saw and a table saw – runs off two 60-volt batteries. And because these tools are 120 volt, they can also plug into a standard wall outlet so that the contractor has the option of running them corded or cordless depending on the job situation. With the new 60-volt battery, many of the cordless tools now have more power than their corded counterparts, added Mannarino. A 60-volt cordless angle grinder has 1,700 watts of power compared to the corded equivalent at 1,200 watts. A new charging station can simultaneously charge four Flexvolt batteries in two hours. Once those batteries are fully charged, it can also operate as a portable power station and run 120-volt corded tools. A new fan-cooled 80-amp 60-minute (or less) fast charger will be included with all 60-volt kits. The 60-volt battery can also be charged with a standard 20-volt charger. This lightweight charging station can also serve as a jobsite power supply. Along with the 60 and 120-volt tools, the company will continue to offer it’s 20-volt line and introduced a number of new 20-volt Max products at the event. One of the goals with the new Flexvolt system is make a cordless jobsite a reality. “Twenty-volt or 18-volt just do not have the power to go after the land of corded and gas powered applications,” he added. 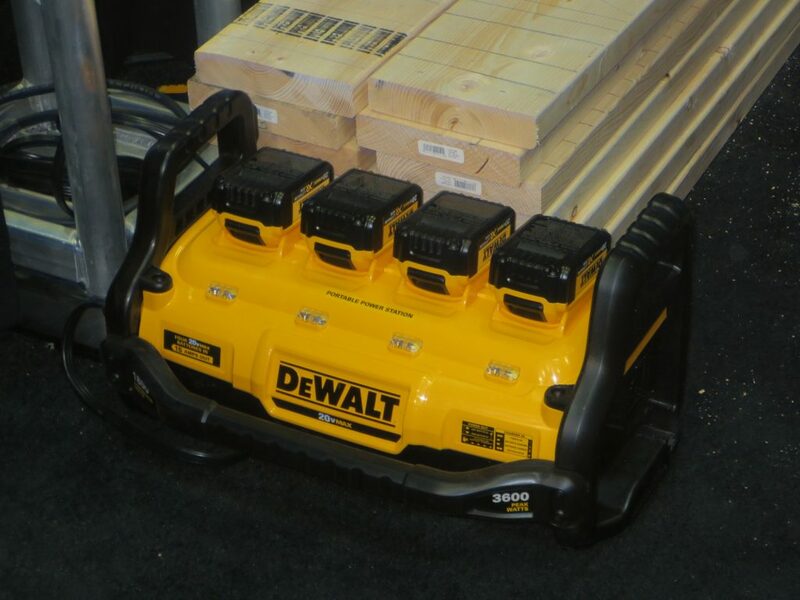 While improved battery technology boosts run time, DeWalt has expended considerable effort in finding other ways to extend battery life. One of those ways has been to improve the design of things like reciprocating saw blades, hole saws, etc. so that they require less power to cut, noted engineer Brad Nohr. “A lot of work went into improving saw blade performance to get more cuts per charge.” In hole saws, for example, a new design for the pilot bit actually pulls the hole saw through the wood. Todd Plajzer demonstrated the new press tools and threaded rod cutter. The other big news at the event was the introduction of specialized mechanical industry tools. Topping the list were crimp press tools for PEX, ½ to two-inch steel and ½ to four-inch copper. In addition to offering its own jaws, the new DeWalt press tools will accept the jaws of other manufacturer’s press tools. The jaws can be changed quickly with a spring loaded locking pin that is either fully in or fully out. There are no electronic sensors to fail, noted Todd Plajzer, product manager for press tools. As well, the neck pivots 360 degrees for working in tight spaces. 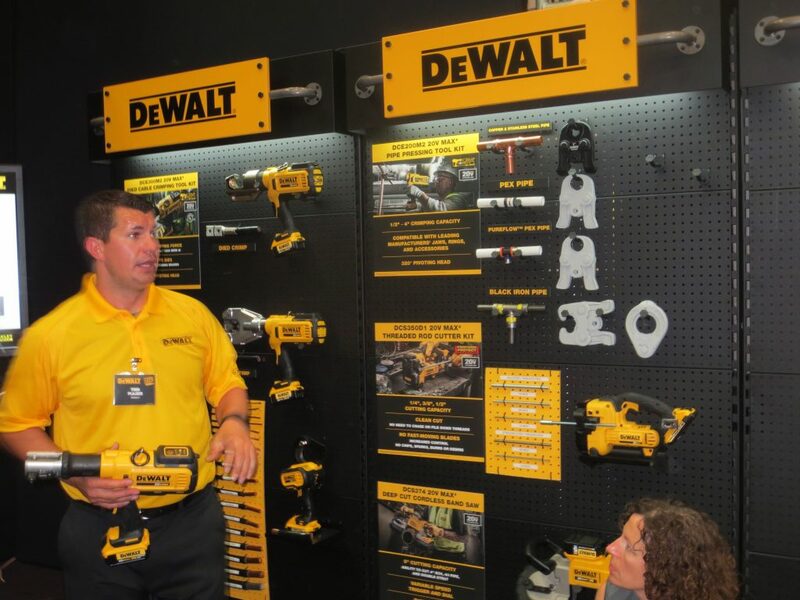 Each press tool uses DeWalt’s free Crimp Connect software, which tracks tool use, reminding the user when it requires calibration. “If an inspector comes by, I can plug it in and show him exactly when it was calibrated,” he added. As well, the contractor can print out a full report for each tool that documents every crimp. The other tool that will have a significant benefit for contractors working on industrial, commercial and institutional (ICI) projects is a cordless electric threaded rod cutter. It cuts ¼, 3/8 and 1/2 –inch mild steel rod and ¼ and 3/8-inch stainless steel rod. Cuts take about two seconds with no thread cleanup required. The tool is designed for use with one hand, leaving the worker with a free hand to hang on to a ladder or railing when cutting. “It’s a huge productivity saver,” said Plajzer. DeWalt expects to introduce the new Flexvolt system and the new plumbing tools in Canada on Sept. 1.